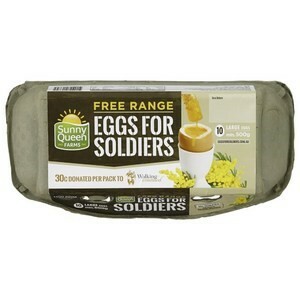 By purchasing Sunny Queen Eggs for Soldiers Free Range eggs, you are supporting our soldiers, with 30 cents from each pack sold donated to Walking Wounded – a not for profit charity organisation whose mission is to support and inspire returning soldiers. Walking Wounded – Soldiers can return from training, war zones or other deployments with physical and mental injuries. Some can find it difficult to transition to civilian life – finding a new job, dealing with mental issues or worrying about finances. They and their families can experience significant stress and trauma. Through mentoring, re-training and adventure programs, Walking Wounded helps soldiers rebuild their lives, regain their confidence, and reintegrate back into society. The charity is working to intervene and prevent the concerning incidences of suicide in the young veteran community through counselling and other support. Walking Wounded is also committed to supporting the Families of our Fallen (Afghanistan) and upholding the memory of their loved ones. Sunny Queen Farms – fresh free range eggs come from farms with a maximum outdoor density of 1,500 hens per hectare – which is only 1 hen per 6 mtr square when outdoors. Eggs for Soldiers eggs are laid on Australian farmer owned, independently audited free range farms. Their hens have access to outdoor paddocks for a minimum of 8 hours per day where they enjoy fresh country air and do all the things that hens naturally do. At night they rest safely in barns protected from predators and the elements. Go to the Sunny Queen website below for some great recipies, interesting facts and you can even watch their chickens on the ‘ChookTracker” – spend time watching (live) the lazy life of their chickens running around the farm! !